The Witch of Lime Street by David Jaher is a book about the life of Margery the Medium. 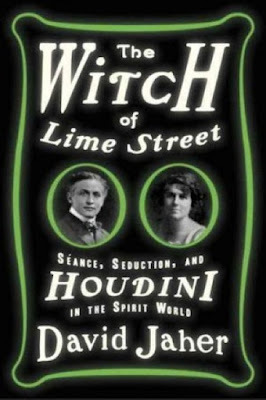 The subtitle of the book is ‘Séance, Seduction and HOUDINI in the Spirit World’. 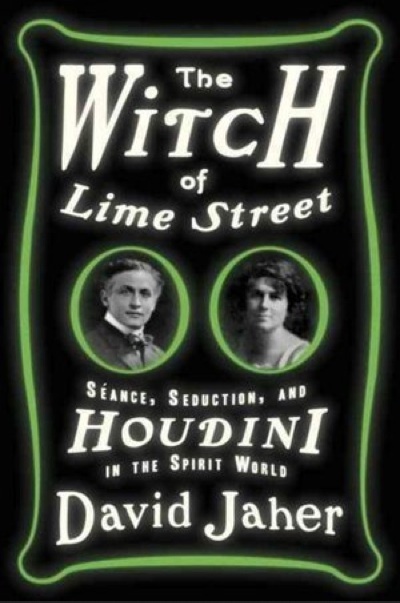 Houdini plays a part, but he is a secondary character even though his image and name appears on the cover of the book. Speaking of the cover, it might be the coolest book cover of ANY book with Houdini because this book cover GLOWS IN THE DARK! It’s very subtle, but I think the glowing in the dark cover and spine add to the already spooky subject matter. When I heard that a first time author was writing this book, I had my doubts about the quality of the content. But having read the book AND listened to the audio version as well, I can tell you that Mr. Jaher did an outstanding job of research. The book is well written, entertaining and filled with history. I had never been that big a fan of Margery until fairly recently. I think for me my interest began when I saw the actual Bell Box that was used in the Margery/Houdini Séances. I also got to see the so-called spirit-fingerprints that Walter, Margery’s spirit guide and brother, apparently created during a Séance. Shortly after this, I started to correspond frequently with the late escape artist and Houdini historian Norman Bigelow, about Margery. I wish Norm had lived long enough to read this book, I know he would have enjoyed it. David Jaher does a great job of laying out the details for the reader of Margery’s character before becoming a medium and after and then during the last days of her life. It would seem that Mina Crandon was a fun loving individual. When she became Margery she developed a seductive air about her. She was overly flirtatious with many men on the investigative committee. No doubt her suggestive behavior helped to take many of them off their game. Despite this she still had standards of behavior that can be seen when Malcolm Bird tried to bring a prostitute to Margery’s Lime Street home and he was abruptly chastised by Margery and turned away. Margery was a complex woman. Early in the book, it’s apparent that she doesn’t believe in any of this ‘spirit nonsense’. Though skeptical, she still attends a séance with a friend and encounters a medium who shares a revelation with her that she has a future in the spirit business. Sure enough, she eventually becomes the best-known spirit medium in the country. Oddly, though she likes presenting séances she claimed she didn’t want publicity. She doesn’t even use her real name Mina; rather she uses a form of her middle name Margery. 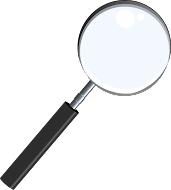 And though she doesn’t want the publicity, she is competing for the top prize in country, to be examined and proven to be genuine by a committee of investigators from The Scientific American Magazine. Yes, she was a complex woman. Houdini is in the book because he plays a major part in the investigation of spirit mediums during the 1920s and he is an important player in the investigation of Margery. The author shares Houdini’s encounters with Conan Doyle and their early friendship as well as their eventual parting of ways. This helps to set-up Houdini as an authority on fake mediums, for the reader. 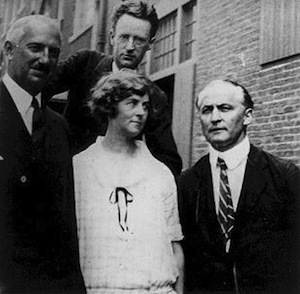 Even one of Houdini’s spirit debunking co-workers, Rose Mackenberg, gets featured in the book. 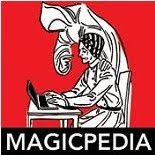 There really is no better person to spot a spirit faker than a knowledgeable magician. I preface that with ‘knowledgeable’ because if the magician doesn’t know anything about fake spirit work, they’ll likely be as taken in as anyone else. Houdini was not the first to expose mediums though he was arguably the most famous debunker. Magicians were involved with exposing mediums since the very early days of Spiritualism. John Wyman, known as Wyman the Wizard at one point helped to investigate the Fox Sisters. John Nevil Maskelyne, in England, went after the Davenport Brothers. So magicians have been at the forefront of investigating fake mediums from the start. One thing that puzzles me is where Margery learned her tricks of the trade? It’s clear that she used deception. But she was creating manifestations that no one else was doing. And she continued to evolve over time adding more and more unique effects to her Séances. A great example would be the ectoplasmic arms and hands that would mysteriously protrude from her body yet no trace of them could be found after the Séance. I really enjoyed The Witch of Lime Street. I’m not the only one, as the movie rights to the book have already been picked up. Will we see a Houdini/Margery movie? Time will tell. But what a fascinating movie it could be. It’s a very unique chapter in history and frankly I think we owe it all to Houdini. Without him, I don’t think there would have been as much press exposure. I also think this unique confrontation would have likely been forgotten over time without Houdini’s participation.